With Halloween drawing close, I figured I should share some of the themed activities that I created for my students this year. I do have quite a few groups working on logical thinking, listening, and inferencing skills, so I love doing "riddle" type activities with them. My Easter Egg Inferences were a pretty big hit with my students, so I figured I should create a similar activity with a Halloween theme. 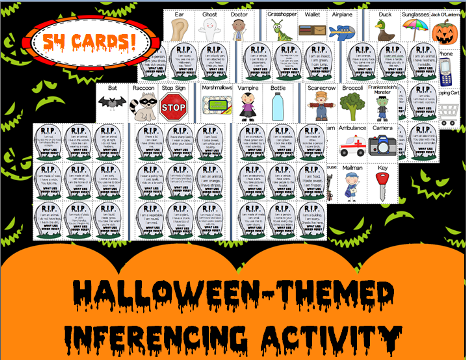 Halloween Inferencing - get it here! • Simply read clues and have students guess what the item is.• Place all the picture cards on the table, then read clues and have students find a corresponding picture. • Show students the picture card first, then have them come up with possible clues that might be on the card. Give points for correct guesses! Just something fun for October. You can find this activity (priced at $3) in my TPT store.